Welcome to the website of the Derby & District Astronomical Society. The Derby & District Astronomical Society (DDAS) was founded in 1974 and is open to all with an interest in astronomy. We currently number over 40 members from all walks of life and whose knowledge of astronomy ranges from complete beginner to advanced. The society holds regular meetings on the first Friday of each month (except July and August) at 7:30 pm at the Friend's Meeting House on St. Helen's Street in Derby. Meetings usually involve an outside speaker, but members also give talks and the society holds a quiz in January. We also hold 'Introduction to Astronomy' evenings at the Friends Meeting House on the third Friday of the month. See below for more information. We are a friendly and, despite our subject, 'down to earth' society. Meetings are a great way for potential new members to see what we're about in an informal and relaxed atmosphere. The social aspect continues after most monthly meetings with a visit to, appropriately enough, The Seven Stars. The society's Flamsteed Observatory near Brailsford houses a 10-inch Newtonian reflector. The observatory is named in honour of England's first Astronomer Royal, the Reverend John Flamsteed (1646-1719), who was born in Derbyshire and attended Derby School. Regular monthly observing sessions are held (weather permitting) at the facility and new people are always welcome. They are now usually held on the second Saturday of the month and start times vary with the season. We are also now holding some of our 'Introduction to Astronomy' evenings at the observatory. The observatory is also available for use by individual members at any time after some simple training. A summer barbecue or fuddle is usually held at the observatory on the Saturday following the first Friday in July instead of a meeting at The Friend's Meeting House that month. Public observing evenings are also occasionally held in Derby at which members share their enthusiasm for the night sky and bring along their telescopes. An annual trip provides the opportunity for members to visit a different site of astronomical or space interest within the UK each year. Several of our members are highly accomplished astrophotographers and our picture gallery is entirely comprised of DDAS member's work. For general information on all our meetings and the benefits of becoming a member please click here. 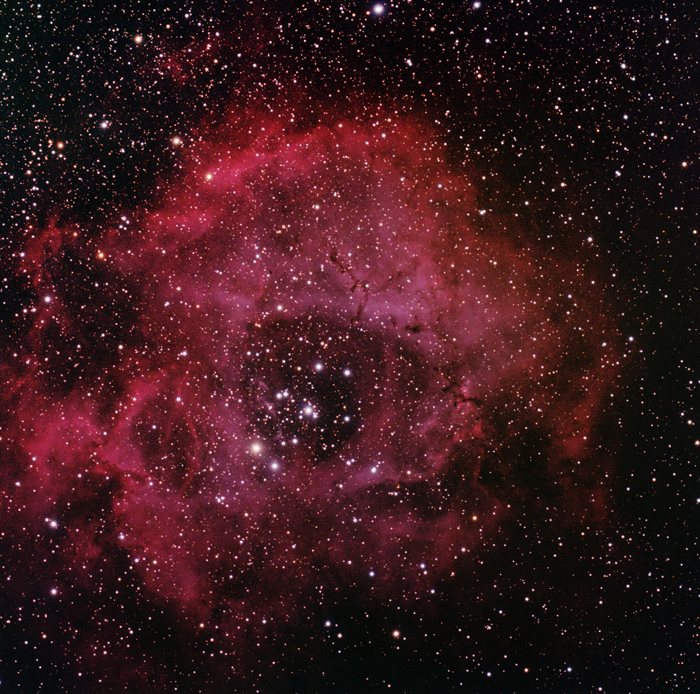 The Rosette Nebula imaged by DDAS member Chris Callaway on the 26th February 2019. Full res image... © Chris Callaway. Our ANNUAL GENERAL MEETING will be held on Friday, 3rd May 2019 from 7:30 pm onwards at The Friends Meeting House, St. Helens Street, Derby, DE1 3GY. This is the start of our membership year and a good time for new people to join, and existing members to renew their subscriptions. You can also get a discount on your subs if you pay at the AGM. Existing members may also vote on society matters and the election of the new committee. There will be a raffle with astronomy book prizes and coffee is provided during the break. Why not join us for refreshments at the Seven Stars afterwards? A COUPLE OF TELESCOPES FOR SALE DDAS member Pete Hill is selling both a 9.25" Celestron SCT and a 200 mm Skywatcher Newtonian, plus accessories. Full details can be found here. LATEST IMAGES! The Flaming Star and Rosette nebulae by Chris Callaway in February 2019. The Moon and Venus by Malcolm Neal in December 2018. The moon in October 2018 by Chris Callaway and the western section of the Veil Nebula also imaged by Chris Callaway in August 2018. The Veil Nebula by Steven Chambers in July 2018. Comet 21P Giacobini-Zinner in July 2018 by Peter Branson. M3 taken by Dave Selfe in April 2018. The California Nebula and the lower portion of Orion taken by Steve Chambers in February 2018. The red sun seen on the 16th October 2017 and of the conjunction of Jupiter and Venus on the 13th November 2017 by Claire Spencer. The Double Cluster and Orion Nebula by Steven Chambers in December 2017. The 37 Cluster by Brian Dodson in November 2017. The Northern Lights from Iceland in October 2017 by Adrian Brown. DDAS IN DERBYSHIRE LIFE... The DDAS has made it into the October 2018 edition of Derbyshire Life magazine, in an article which talks about how to stargaze from our county. The article includes photos from some of our members, and our public relations officer, Anthony Southwell is also quoted. An on-line version of the article which includes one of the DDAS photos is available here. To see the full article get a copy of the magazine! MERCIA MARINA EVENING... The DDAS was invited to give an astronomy evening at Mercia Marina on the 1st September 2018. Pictures from the event can be found here. DDAS BBQ 2018 On the evening of the 7th July 2018 DDAS members enjoyed the annual barbecue at our Flamsteed Observatory. But due to the tinder dry conditions in our countryside location, we didn't actually light the barbecue itself and the event became a fuddle instead! The following pictures were taken by Neil Breakwell. CULHAM REDUX So popular was the DDAS trip in 2017 to the Culham Centre for Fusion Energy that a second batch of members got to see how you build a star on Earth on Saturday 28th April 2018. The full story and pictures from the 2017 trip may be seen here and the article concludes with a group photo from the 2018 visit. FREE TELESCOPE HIRE SCHEME Members may now hire a telescope for free at our monthly meetings and unlike our previous arrangement you don't have to have been in the society for any particular length of time - so brand new members can now take advantage of this scheme! For more information click here or ask a Committee member at one of our meetings. DDAS LIBRARY Members may borrow books for free from our growing library. Loans last for one month or more, depending on whether other members may wish to borrow a loaned item. The library is available at our main monthly meetings for browsing, borrowing and returns. A number of these volumes were kindly donated by the estate of the late Keith Plamping, DDAS member. The library contains nearly 70 volumes and the books cover a wide range of astronomy related subjects. The current list of books can be seen here. For brief summaries of a small selection of these books click here. For more information please ask for Libby Ray at one of our meetings. Last Updated: 6th April 2019. Click here for what's new on the site.